Load on all matching rows. The Data Loader add-in for Microsoft Excel makes copying,loading, processing, and transferring data from one XLS workbook or worksheet to another extremely easy. It is compatible with Microsoft Excel 2007 to 2019 and Office 365. By loading data with the Data Loader you eliminate manual input errors and get the work done far faster. Data is loaded based on unique identifiers such as cells containing an ID number, a social security number, unique labels, or a combination of identifying cells. Data that is not loaded can be marked for easy identification and follow-up. The data can be in any order. Data Loader has many options and is menu driven for ease of use. Greg Swedberg wrote: "I really appreciate all your work and discussion. It really helped me understand how the Data Loader works. I do use a number of your products but Data Loader is incredible. At my old job, I did this stuff by hand and it would take months. Now it takes an hour? At most? That’s incredible!! Thank you for all you do. If I can help further please let me know." The first three loaders above (Super Fast Loader, Fast Loader, and Power Loader) are designed for users who need to load price or other data based on data identifiers from one worksheet to another worksheet. The Super Fast Loader is extremely fast, about 5X faster than the Fast Loader. The Fast Loader is about 5X faster than the Power Loader. The Super Fast Loader is for loading data where both the source and destination sheets can be sorted. The Fast Loader does not sort, and has similar features. The Power Loader has the most features. When you load your data, the source and destination worksheets can be in different files. The data in each worksheet can be in any order. 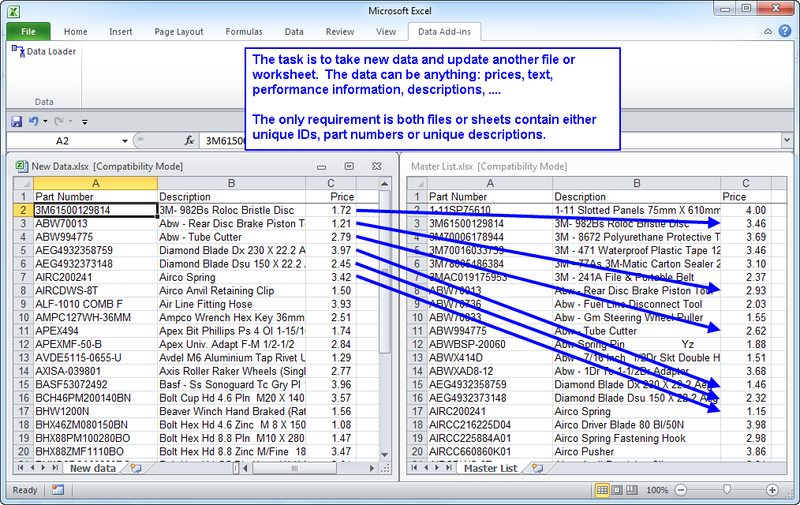 Both use ID columns such as product numbers to identify and load data. And both will tell you which data has been loaded. Combine up to three columns to be a data identifier key. Identify data that is not loaded so you can follow-up on it. Specify a column that controls which sheet is used as the destination sheet in case data is to be loaded to different sheets. and you want to load the data in columns C into another sheet based on the names created by combining columns A and B.
Lookup Assistant - Match data from one list to another the easy way.